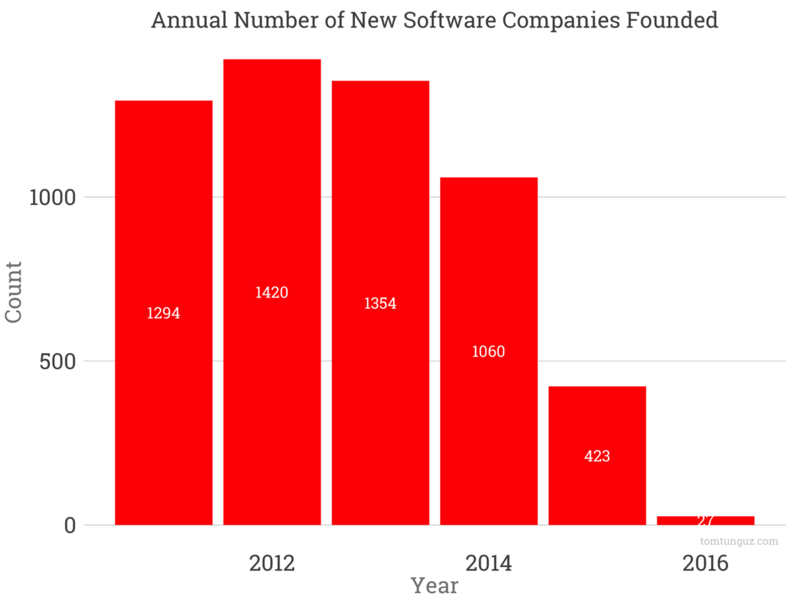 The rate of new software company formation seems to have declined materially in the past few years. In 2011-2013, about 1450 software companies were founded each year on average. In 2014, that figure fell to 1186 and in 2015, we count 481. Why does Crunchbase data indicate this decline? First, there might be a few data issues in the most recent years. Perhaps software companies remain in stealth longer. Perhaps there a substantial delay between when the business is founded and when it appears in Crunchbase. However, Pitchbook analysis corroborates this trend. This is counterintuitive considering the broader venture capital backdrop of near record venture investment in software. In addition, the sheer size of the Martech landscape growing to more than 3500 companies up from 150 in 2011 implies torrid growth as well. But if we assume the 2014 cohort is accurate, then the data suggests an 18% drop in software company formation. Why could this be? First, the competitive intensity has increased in each segment. The overlapping logos in the Martech landscape visualize the lack of oxygen in some of these segments. Second, the key systems of record in SaaS are already in place. Salesforce, Netsuite, Marketo/Eloqua/Pardot/Hubspot, Zendesk. Subverting those incumbents is going to require a meaningfully better product or substantially more effective customer acquisition channel. We haven’t really seen a discontinuity of the magnitude SaaS presented to server/client, yet. The promise of mobile remains only somewhat fulfilled. Machine learning in SaaS is nascent. Chat bots, too, are early. Third, the recent concentration of seed investments in fewer companies might contribute to a decreased rate of founding. Seed round volumes in 2016 have halved compared to 2015, but increased in median size by 40%. According to this data set, startup formation fell 11% over the same time period, but software company formation fell nearly twice as much at 18%. If it is a long term trend, it means less competition for new founders.